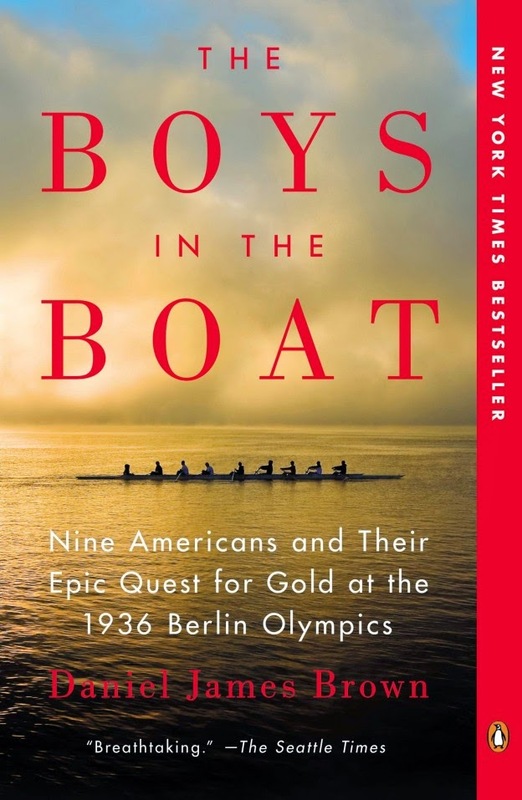 a book chick: "The Boys in the Boat"
"The Boys in the Boat"
my take: I finished this at 1:15 a.m. At about midnight I realized I was a goner - needed to find out what happened and wasn't going to be able to sleep until I did. I found this a little hard to get into ... as I look back on the reading experience, it sort of mirrors the rowing experience ... herky jerky at first and then smoothed out and found the "swing": first couple chapters were iffy, then it was easy sailing. This would be an excellent book discussion read - so much to talk about and so much US history I either forgot or never heard. The Dust Bowl, East Coast vs. Western US, the Depression, rowing, World War II, propaganda. The main story focuses on Joe Rantz, one of the boys in the boat, and neighbor to the author. I have to say, my heart bled for Joe and I cried a couple times for him. my source: my father-in-law and various other family and friends ~ with thanks to all! my verdict: yes! read this! A non-fiction that kept you up past bed time?! Definitely need to recommend this to my non-fiction-every-3-months book club as we've had some duds lately (and it's always so hard to come up with that many good ideas).